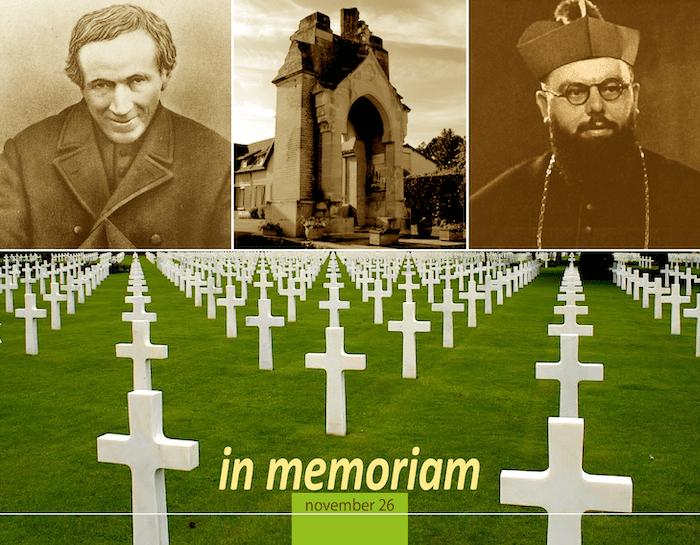 Today, November 26, is “Dehonian Memorial Day,” a day in which SCJs throughout the world honor members of the Priests of the Sacred Heart who gave their lives as martyrs. It was on November 26, 1964, that Bishop Joseph Wittebols, along with six other SCJs, were martyred in Congo. In total, there are 49 SCJ martyrs. As noted on Veterans Day, this year, in commemoration of the 100th anniversary of the end of World War I, Dehonians remember in a special way those who were impacted by the war. Thirty-three Dehonians lost their lives during WWI. The General Postulator prepared several materials about this year’s Dehonian Memorial Day. Most of the written text is in Italian, but there are photos of the Dehonians who died, as well as SCJ locations damaged in the war. Click here to access the information on the general website. 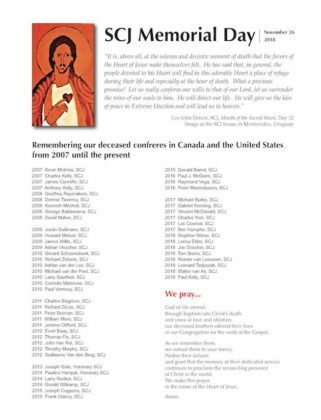 Each year the US Province Dehonian Associates Office prepares a reflective piece to commemorate the deceased SCJs of North America; this year the focus is on SCJs who died from 2007 to the present. Click here to access it. Click here to access the online North American Necrology. Fr. Gustave with Fr. Carlos Luis Suarez Cordorniú during the 2018 General Chapter. On November 19 the General Administration named Fr. Gustave Lulendo N’Dotony, SCJ, as the next regional superior of Canada. Fr. Gustave will succeed Fr. John van den Hengel, SCJ. Fr. Gustave is originally from the Democratic Republic of Congo. 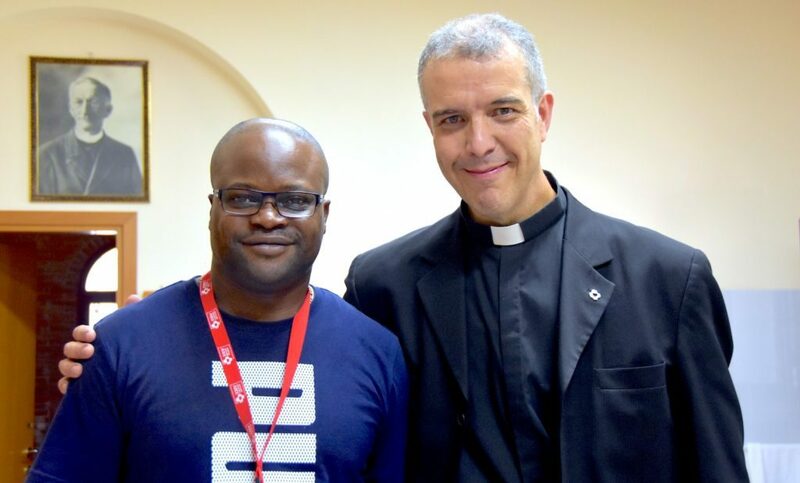 He has studied in the United States (ESL) and in Canada (theology at St. Paul University in Ottawa). Currently, he is superior of the Montréal community. Internationality is a theme not only in Fr. Gustave’s religious life, but in his family life as well. His grandparents left Angola for political reasons, later establishing the family in DR Congo. Fr. Gustave later learned the challenges of immigration himself when he applied to study in Canada. It was a year-long process, followed by stressful visa application renewals. Fr. Gustave begins his first three-year term on January 16, 2019. Please note: Fr. Gustave has a new cell phone number; it has been updated in the online directory. 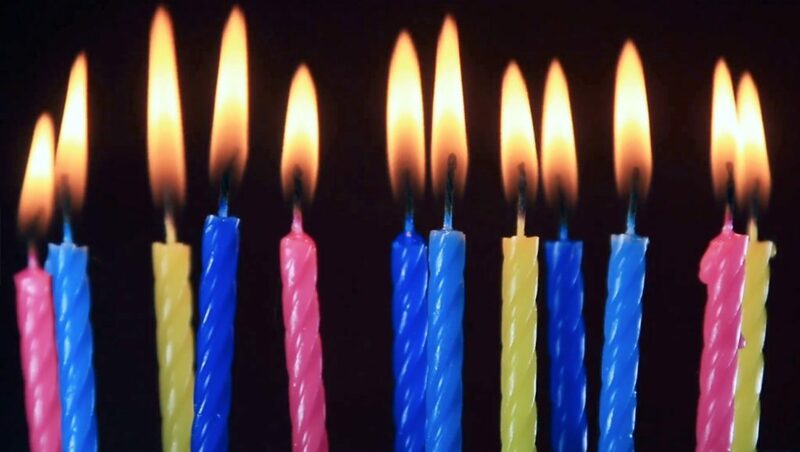 Those celebrating birthdays in December include: Fr. Chuck Wonch (72) on Dec. 5, Fr. John Strtittmatter (83) on Dec. 6, Fr. Gary Lantz (83) on Dec. 8, and Br. Clay Diaz (54) on Dec. 19. As we noted last week, “Our Future Together in Community and Ministry, Part II,” will be held January 8-10 at the Provincial Conference Center in Hales Corners, WI. Attendance at the provincial conference is mandatory for all SCJs 70-under who minister in the US Province (as well as novices). To ensure that all who have been invited are making plans to attend, Fr. Ed Kilianski, SCJ, asks that they RSVP to Br. Frank Presto, SCJ, by December 15, 2018. If you are from outside of the Milwaukee area, please indicate in your response when you will arrive and where you are staying (or if you need a lodging assignment). The conference will begin at 9:00 a.m. on Tuesday morning (January 8) and conclude with Mass, followed by lunch, on Thursday, at 1:00 pm (January 10). Also, a reminder about the June 11-14 assembly in Hales Corners: ALL SCJs, novices and candidates in the US Province and Canadian Region are encouraged to take part in the assembly. Invitations will go out at the beginning of the year. Fr. Anthony Gittins, CSSp, author of the book, Living Mission Interculturally, will be the featured presenter. Click here to purchase the book from Amazon (it is available electronically and in print). 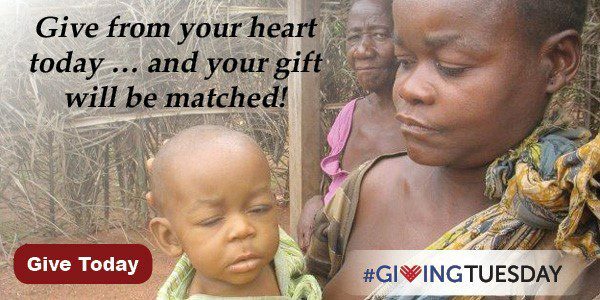 Following Black Friday and Cyber Monday we encourage you to join with us tomorrow in GIVING TUESDAY, a global day of giving to others. The focus of the Province Development Office this year is on supporting a shelter for homeless children in the Congolese Province. +S. Justin Mpanzore Nduipi, a member of the Congolese Province, died November 23. He was born in 1985 and made his first profession in 2015. +Br. Pietro Morandini, a member of the North Italian Province, died November 12. He was born in 1929 and professed in 1950.
in our Congregation for the work of the Gospel. we entrust them to your mercy. in the name of the Heart of Jesus.